Ideal for protection against dust and scratches of your expensive lenses. Especially in the mountains and at the sea side the UV radiation causes a bluish tinge and reduces the sharpness and contrast. 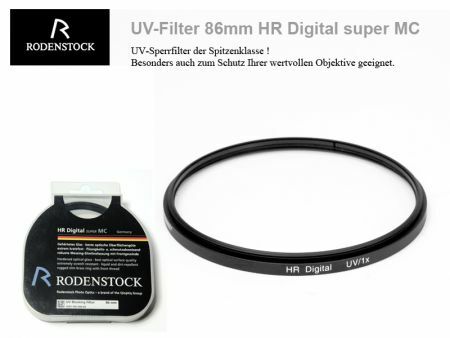 The Rodenstock UV-Filter HR Digital super MC blocks the UV radiation and ensures a perfect color neutrality and higher contrast. 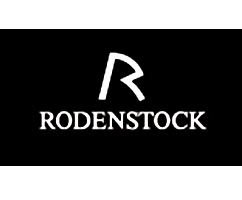 Due to the perfect color neutrality, Rodenstock UV blocking filters are also ideal protective filters which can stay on the lens at all times. They protect the front lens element against dirt, can be cleaned more easily than the lens element and protect the front lens element against scratches and blows. They are also free of vignetting with wide-angle shots because they have a thin, slimline frame. They have a front thread so a protective cap or a lens hood or a further filter can be screwed on as required. In comparision with the Rodenstock Digital pro MC the HR Digital super MC distinguishes itself by an even more resistant coating (hydro- and oleophobic) and a very high-class brass frame. This Product was added to our catalogue on Friday 25 April, 2014.